Buses serve as the backbone of the public transport network on the Gold Coast, particularly on the south coast where they are the only form of public transport. All Gold Coast buses are numbered in the 700s except for the TX1, TX2 and TX3 lines, which are express routes between the theme parks and different hubs on the Gold Coast. You can purchase a paper ticket on the bus, though you’ll save some cash if you use a GoCard. To check which station is closest to you, what bus you need and timetables visit jp.translink.com.au. If you'd like to see the hinterland (and you should), or just have easier access up and down the Gold Coast's 70km of beaches, then renting your own car is more or less essential. Smaller local outfits usually offer lower prices, although going with the larger international agencies will get you the usual perks, such as frequent flyer miles. In addition to those locations listed below, Avis, Hertz, Thrifty, Europcar, Budget and Redspot also have desks at Gold Coast Airport, where they keep much longer hours. Cycling, or riding as locals call it, is an excellent way to see the Gold Coast and get about. There are hundreds of kilometres of dedicated cycle paths, along the coast between Surfers Paradise and The Spit is particularly good for families, while longer cycling routes or using a bike for transport will likely mean taking to the road, but don’t fear, most roads have marked bike lanes and drivers are getting increasingly cycler friendly as more people are opting for two wheels instead of four. Bear in mind while on the road you have to obey all the road rules, if you sneak through a red light you risk a very hefty fine. If you are on a bike in Queensland, whether on the road or off, you are required by law to wear a helmet, while lights are a must at night - these things may seem trivial to European cyclists though local police enforce these laws strictly handing out fines regularly. Most parking on the Gold Coast is on the street, very often for free though there are metres in busier areas. Street parking is generally safe, though of course you should never leave valuables in the car. When parking on the street always check the signs and parking metres for local conditions, for instance two or even one hour parking limits (denoted 2P or 1P respectively) are common even in free parking areas, so you may need to actually move your car after an hour or two or risk getting a fine. Rates and operating hours vary depending on where you are, naturally Surfers is the most expensive at $3.60/hr and has the longest operating hours Monday to Saturday 9:00 - 19:00 and Sunday 9:00 - 17:00. There are also many off-street car parks at popular destinations throughout the Gold Coast, these are especially handy in areas where parking restrictions apply since you might be able to avoid having to move the car regularly. Some of these car parks also offer daily discounts. If you're in Australia, you can get more useful info about parking on the the municipality's official page. However, if you're outside Australia you’ll have to use a VPN to visit the site, as the page is geo-blocked for some reason. For trips up and down the Gold Coast, including connections with Tweed Heads over the border in New South Wales, there are plenty of buses available. 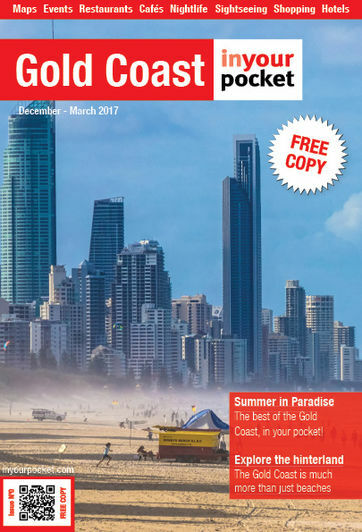 To traverse the Gold Coast in its entirety will likely take you upwards of an hour and half including transfers at one or more of the main local transport hubs. Since 2014 there is also a light rail, called the G:link, connecting Southport, Surfers Paradise and Broadbeach, the southern most stop being just metres from Pacific Fair Shopping Centre. Whether you are catching the train on the Sunshine Coast, a ferry in Brisbane or a bus on the Gold Coast, conveniently you can use the same prepaid regional pass, called the GoCard. You can purchase a GoCard at stations and newsagents, though frustratingly not at the airport. The GoCard also gives users off-peak discounts if you travel between 8:30 - 15:30 and after 19:00, plus all day on weekends. Concession GoCards are available for Australian pensioners and Queensland students, but unfortunately an ISIC card won’t help you out. The flip side of the GoCard is South-East Queensland’s 23 zone fare structure that can be a bit confusing to say the least - the most important thing to remember is to touch on and off lest you be charged for many more zones than you actually travelled.For just getting around the Gold Coast on buses and the light rail it’s worth grabbing the Gold Coast Go Explorer Card for $10 ($5 for kids) offering unlimited travel for the day. Unfortunately there are basically no services into the hinterland so to get to Springbrook or Mt Tamborine - both destinations are well worth exploring - perhaps think about hiring a car or else joining a tour. There is basically only one taxi company on the Gold Coast, namely Gold Coast Cabs, which first starting plying the streets of the area way back in 1937 and now boasts some 350 vehicles, making it the larger regional operator in Queensland. The company has modern cars, professional drivers and 24hr services, they also have larger vehicles for groups and disabled passengers. A ride from the Airport to Surfers Paradise will cost upwards of $55, while a cab to Brisbane will be $250 or more - luckily they accept credit cards. For a taxi call 131 008 (from an Australian number) or try your luck at hailing a taxi on the street. There are also numerous cab ranks at popular spots across the city. For those out late in Surfers on Friday or Saturday night Gold Coast Cabs and the QLD government have teamed up to get you home safely, and relatively cheaply, offering flat-rate rides across the Gold Coast from 23:00 - 05:30, the service operates out of the taxi rank on the south side of Cavill Avenue opposite Fiddlers Green. However, given the traditional player's near monopoly it's no surprise Uber has been a popular addition to the Gold Coast’s transport options. For most visitors the train really won’t be that useful for getting around the Gold Coast itself, where buses are the backbone of the public transport network. Though the regular services between the Gold Coast (Nerang, Robina or Varsity Lakes stations) and Brisbane which take just over an hour are great way to get up and down the coast, while the train also connects the Gold Coast with Brisbane’s domestic and international airports. For the cheapest fares pick up a go card and travel during off-peak times (Mon-Fri 8:30 - 15:00 and after 19:00, plus all day on weekends and holidays) and bear in mind that a separate operator owns the Brisbane Airport stations so there is a premium for airport connections. Check the timetable and which of the Gold Coast’s stations works best for you at jp.translink.com.au. Currently present in some 70 countries and more than 500 cities worldwide (one of which is of course the Gold Coast), Uber is the world's most well-known semi-legal, semi-regulated private taxi service masquerding as a tech company. For those of you who haven't yet used it, presumably because it's not available in your home country, you simply download the app, link it to your credit card, and you can then call a car to pick you any time you want with a couple of taps. Payment is automatic, tips are not excepted, and the drivers have to be overly nice to you since at the end of the ride you get to rate them. On the Gold Coast the base fare is $2.00, with each kilometre adding $1.00 and each minute an additional $0.35, making an Uber ride significantly less expensive than taxis.